Decorating your nursery in a shabby chic style is easy, fun and can save you a buck or two in the process, because shabby chic is all about combining the old with the new in a warm, comfortable nursery style that is uniquely you! Just about any piece of second-hand furniture or any decor accessory that has special significance for you can be incorporated into your baby nursery design to bring the celebration of treasured memories into your nursery decorating. If not - begin your hunt at yard sales and second hand stores where you'll find a treasure trove of inexpensive nursery furniture and decor items. Second hand cribs can come with all sorts of infant safety issues, depending on their age. Never sacrifice style for the well-being of your new born. Ready To Start Your Baby Nursery Decorating? First you'll need some beautiful shabby chic decor to start you off. 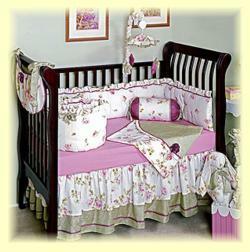 Shabby chic crib bedding and nursery chandeliers are a great spark for nursery decorating color schemes and ideas. Homely, muted neutral baby nursery colors of white and cream, combined with soft pastel shades of pink, blue and green. 2. Apply a coat of paint in your chosen neutral or pastel nursery color and allow to dry. 3. Sand some of the top coat off to allow the light color underneath to show through creating an aged distressed look. A combination of new baby nursery furniture pieces with a distressed paint finish and old worn vintage items. Make sure that you do not end up with too many shades and colors though - your nursery furniture pieces must complement each other to bring harmony to your nursery design. Natural cotton and linen nursery fabrics in light, faded or pastel tones and patterns. 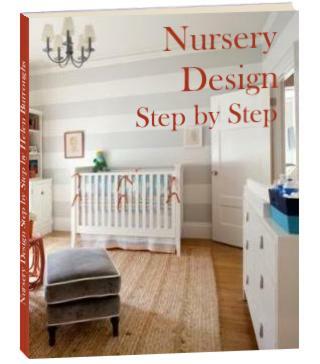 Floors with a large area rug echoing your chosen baby room colors - checks and stripes work especially well in a shabby chic nursery but make sure not to make your overall nursery design too busy. Meaningful nursery accents and accessories such as old photo frames, vintage baby clothes, collectible teddy bears and heirloom chandeliers - the more vintage nursery decor the better! Don't forget to add a gorgeous shabby chic nursery chandelier! Dimples and Dandelions have some gorgeous ones to choose from. Have fun creating your shabby chic baby nursery design! The shabby chic style is all about celebrating the old with the new. Make it welcoming, personal and full of love - uniquely you! For more inspiration don't miss the gallery of shabby chic nursery photos!